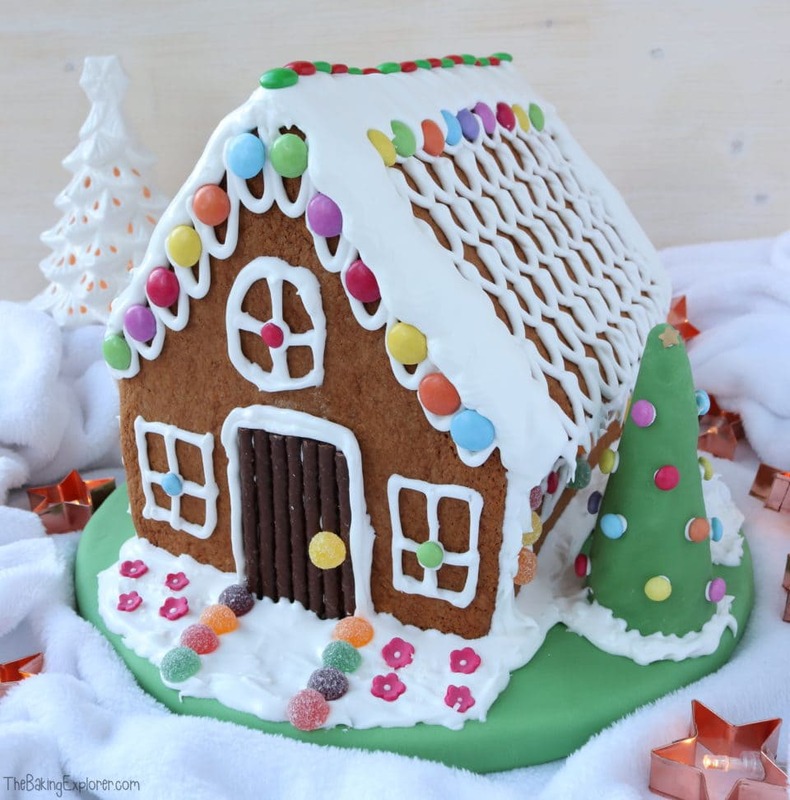 A Gingerbread House just screams winter and Christmastime doesn’t it?! I absolutely love how they look, how they all can be so different, and of course how delicious they taste! It’s such a fun baking project to get you in the festive mood, plus kids and adults alike will have so much fun getting creative and decorating the house. 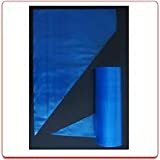 I’ve created a free template for the pieces, which you can download and print out by clicking on the links within this post. Of course you can also buy Gingerbread House cookie cutter sets too. 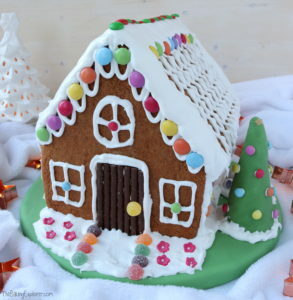 I really love the gingerbread recipe for this house as it’s the perfect texture and taste. Don’t forget to tag me on social media so I can see your Gingerbread House! 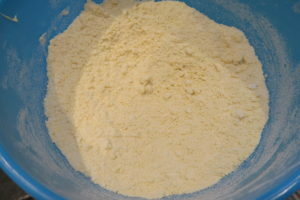 In a bowl I put plain flour, bicarbonate of soda, and butter. 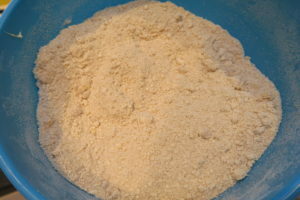 Using my fingers I rubbed the mixture together until it resembled fine breadcrumbs. Then I added the ground ginger, mixed spice, and light brown sugar and stirred it in. In a pan I gently heated golden syrup, and in a bowl I beat eggs. 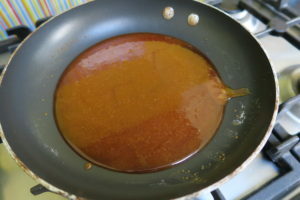 I made a well in the flour mixture, and poured in the eggs and golden syrup. 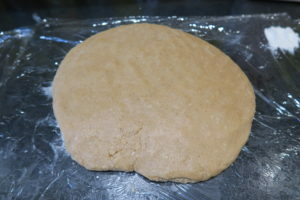 I combined the mixture together until a dough formed. Then I wrapped it in cling film and put it in the fridge to chill for 1 hour. I didn’t use a cookie cutter set for this house, I made my own template which you can print and download using the link below. 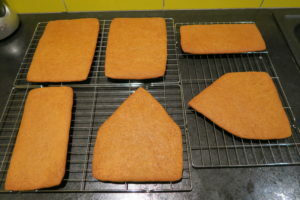 I rolled out the dough to about 5mm thick and used my template to cut out the shapes of the house: two sides, the front and back, and two roof pieces. 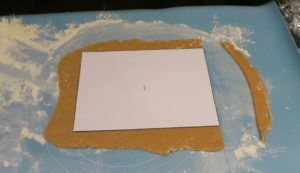 Click here to download and print out my Gingerbread House template! 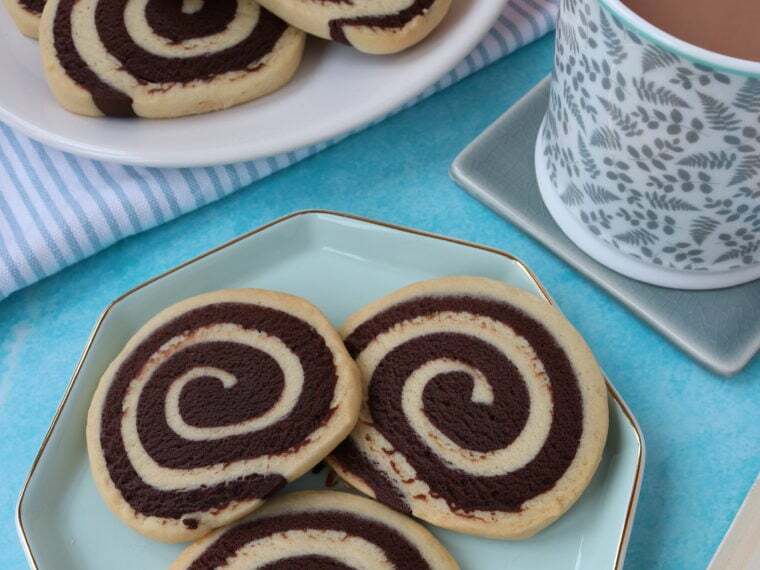 I placed them onto lined baking trays and baked each one for 15 minutes. Then I let them cool fully on cooling racks. 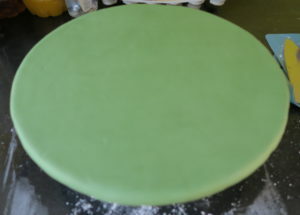 To display the Gingerbread House I covered a 12″ cake board in green fondant. I decided to use caramel to stick the pieces of the Gingerbread House together as it sets quickly and goes very hard. First I heated sugar until it went golden, then I kept the caramel on a very low heat whilst I stuck the pieces together. I started with the front piece and stuck both the sides to it. Then I put the back on, and finally the roof. Caramel hardens very fast so you have to work quickly, and an extra pair of hands is highly recommended. 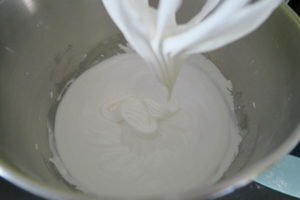 To decorate the Gingerbread House and create a snow like effect I made some royal icing by whisking together egg whites, icing sugar and cream of tartar until thick. I placed the house on the cake board and began decorating. I piped roof tiles, window and door shapes onto it using the royal icing which I had put in a piping bag with the end snipped off. It’s up to you what sweets to decorate with, I chose M&Ms, Smarties and Jelly Tots and stuck them on with the royal icing. 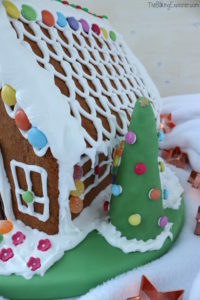 I added a Christmas tree at the front of the Gingerbread House, which I made by wrapping a waffle ice cream cone in green fondant and sticking mini Smarties onto it for baubles. And the Gingerbread House was complete! All that’s left to do is snap a few festive photos, then it’s demolition time! 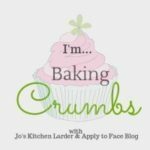 I’m linking up with Baking Crumbs hosted by Apply To Face Blog. Then it's time to get creative! 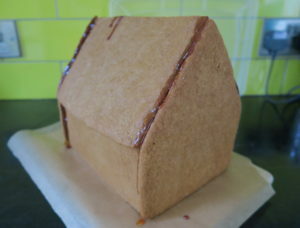 Put the royal icing into a piping bag and pipe on roof tiles, windows and a door. 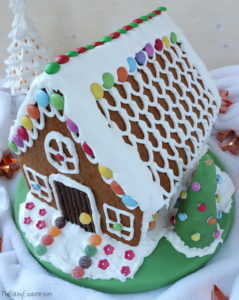 Stick any sweets onto the house using the icing as 'glue'. 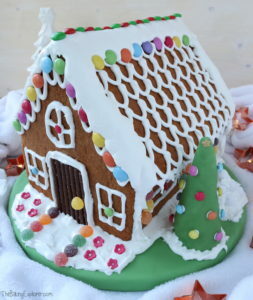 Add more icing to cover the edges of the house and make it look like it's been heavily snowed on! I made a Christmas tree by wrapping a waffle ice cream cone in green fondant and sticking mini smarties baubles onto it. I also added a pile of snowballs next to the house. Add whatever you like, maybe some gingerbread people with extra dough? Make sure to have fun and make it your own! Kat that looks great! Really really impressive for a first time build and I love the roof tiles – genius! I have never attempted one but totally agree that it would be too heartbreaking to eat it. Hi Kat,I made it with my daughter and it is fab!!! Great recipe so plan to make it each year now! First time with royal icing too. Went piping crazy. Would love to have it at #BakingCrumbs if you have five mins. Will try and post a photo on your Facebook link. Have a great Xmas! Jenny I’m so thrilled to hear this, thank you for letting me know! !